Don't take me wrong, I did like this book I just didn't like it. I know that made no sense whatsoever. I liked the idea of it, just not this particular book. I loved the first 40% of it and then it all went down-hill. In the beginning we have a really nice introduction of all the characters and it's all just perfect. The beginning, I thought, was really sweet. We got to know Ethan a bit better, we got to know Prenna and the futuristic rules that her people has so we got an insight of the book. 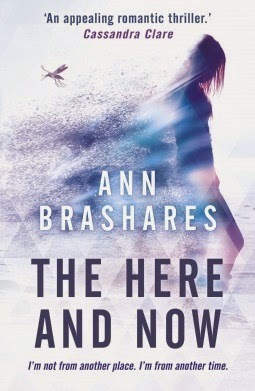 I feel like if Ann Brashares were to write a trilogy or a duology she could have used this book's entire content to write that trilogy/duology. After those 40% everything was smushed together in a big mess and most of the time I was so confused and was wondering what the heck was happening! Every book has - as Veronica Roth puts it - a climax and I feel like the climax in this book wasn't really a climax. Something did happen but it wasn't a real thing. What did happen could've been one of the "build-ups" to the actual climax. There were sometimes when you'd start thinking that maybe everything would go better but when it didn't it became more of a disappointment. I'm not the person to give a book one or two stars because there were some really great and sweet moments but it did not weigh up to all the disappointments. I know that Ann Brashares has written another series called the Sisterhood of the Traveling Pants. I know that a lot of people love that series (I haven't read it) but did not love this. I did want to love it though, because I thought it sounded really interesting but unfortunately, I didn't like it.